Throughout their lives, many people will go through a crisis or challenging occurrence. While experiencing crises and challenges is a normal part of life, not everyone knows how to handle or respond to a crisis while experiencing it. I find that many clients of mine are attempting to cope with a crisis in their life and are looking for skills to utilize when the crisis is currently occurring, or even to handle a crisis that happened in the past. If you read my recent blog post, “5 Ways to Practice Resilience in the Face of Adversity” you may have learned how to handle adversity. This post, based on a recent Medium article titled, “Resilience: How to Rescue Yourself from Adversity,” focuses simply on how to handle a crisis. In the article, author Gustavo Razzetti discusses 5 different strategies for handling a crisis. • Restructure. Similar to Cognitive Behavioral Therapy (CBT), attempt to restructure the way you are processing both your thoughts and feelings. Identify the feeling you are experiencing, such as fear. After identifying the feeling, attempt to find the evidence that supports your fear. After you have identified the evidence (the situation) that supported your fear, attempt to think of an alternative outcome. For example, the 12 boys trapped in a cave in Thailand likely had a fear that they were going to die in the cave. But perhaps their coach attempted to restructure those fears by providing evidence that a rescue team could help rescue them out of the cave. • “Down the Rabbit Hole.” Maybe you have gone “down the rabbit hole” and are thinking of the absolute worst case scenario. If you have gotten to what that may look like, prepare yourself to face that reality. Perhaps sit in the uncomfortable feeling and think of ways you could adapt if the worst possible outcome did come to fruition. By adapting to what the worst case is, it may not feel quite as threating. • Create Different Plans. Attempt to think of what a different path would be like for you. When doing this, you are now in the driver’s seat facing the crisis as opposed to the passenger seat going for a ride. You now can attempt to see the crisis as a challenge that can help you grow as an individual instead of as an obstacle with no solution where you feel stuck with no way out. • Support System. When experiencing a crisis, it is incredibly important to reflect on who is in your corner supporting you. Without leaning on your support system, whether it is your significant other, close friends, or family, a crisis can be much more challenging. • Mind-Body-Spirit Connection. During a crisis, our mind, body, and spirit can feel disconnected and go in different directions. It is very important to practice connecting all three when facing crises as that will help you calm down. You can practice this through meditation. Being present in the moment and practicing deep breathing exercises can allow the mind, body, and spirit to sync up with one another and help you think more clearly when facing the crisis. 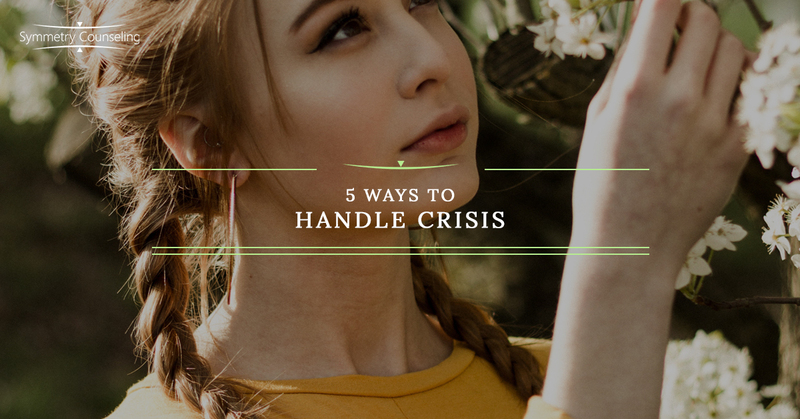 While this list provided a variety of ways to practice coping with a crisis when faced with adversity, attempt to focus on the one(s) that you think will help you most overcome adversity in your life. If you too are currently struggling with a crisis in your life, it may be a good idea to connect with one of our skilled counselors at Symmetry Counseling today. You can contact them at 312-578-9990 to set up an appointment.